Udon Thani certainly isn’t the most naturally beautiful province in Thailand, but it still has plenty to offer visitors looking to experience a side of Thailand away from the main tourist trail. Located in Thailand’s north-eastern Isaan region, Udon Thani city is the ideal base to explore the province which shares the same name. In recent history, Udon Thani was an important American base during the Vietnam War, but it is for its prehistoric history that the area is particularly famous. Ban Chiang in Udon Thani province is a Unesco World Heritage Site which is regarded by scholars as the most important prehistoric settlement so far discovered in South-East Asia. Ban Chiang is particularly famous for its pottery and visitors to Udon Thani will see replicas of Ban Chiang pots at various locations in and around Udon Thani including the airport and train station. The name Udon Thani translates as the ‘northern city’ and as its symbol has God Wetsuwan the celestial guardian of the Northern Heavenly Gate. If you look carefully during your travels in Udon you’ll see his likeness depicted on street signs and official buildings. 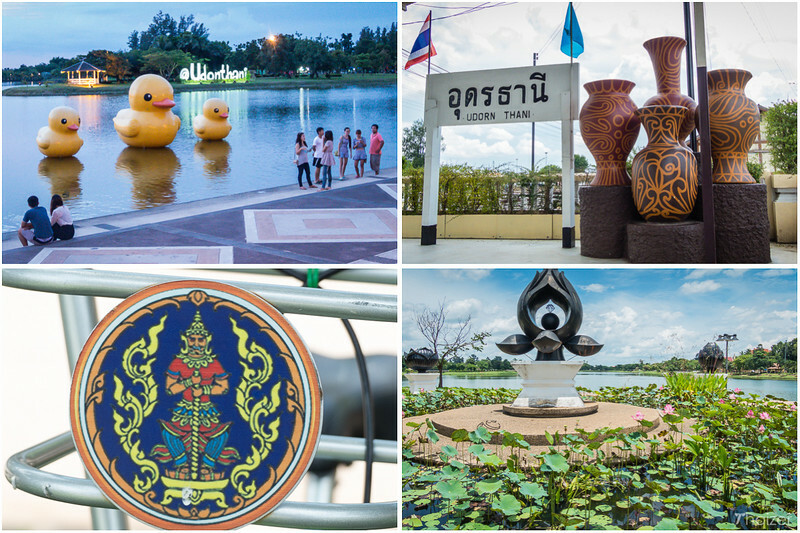 In the city of Udon Thani, the highlight is the delightful Nong Prajak Park. Local families come here at weekends and in the evenings to enjoy the wide-open spaces and scenic lake. A circuit runs around the perimeter of the park with separate lanes for joggers and cyclists (make sure you keep to the one-way system in operation). History buffs should make a beeline for the nearby Udon Thani Museum where they can find out more about Ban Chiang and the history of the area. There are a number of temples in Udon Thani, but the most impressive is Wat Photisomphan. On Saturday evenings an excellent Walking Street market sets up in the vicinity of the City Pillar Shrine and the Town Hall. Close to the train station, UD Town and Central Plaza are both good for shopping and an interesting night market can be found in between the two. On the opposite side of the railway tracks, Nong Bua Park is another pleasant expanse of greenery set around a lake and is perfect for walking or cycling. The park is also home to an important Chinese shrine, Chao Pu Ya. Away from the city but still in Udon Thani province, the Red Lotus Lake is popular with Thai tourists. Other attractions include Ban Chiang and Phu Phra Bat Historical Park with the latter well-known for its strange rock formations. In 1885, King Rama V appointed Prince Prajak Sinlapakhom to lead troops against a Chinese warlord and rebel troops in what is now Laos. Almost 10 years later, Siam was in dispute with France with the latter wishing to extend its influence in the Indochina region. In a diplomatic move, King Rama V sacrificed some land on the other side of the Mekong River. The agreement reached meant that a ‘demilitarised’ zone was agreed. With Nong Khai falling within the zone, the Siamese were obliged to look for a new strategic base further back from the Mekong. Prince Prajak chose Ban Dua Makkhaeng and in doing so established what is now known as Udon Thani. Regarded as the founding father of Udon Thani, a statue of Prince Prajak dominates a roundabout in the centre of the city. Locals come to the statue to make offerings and wish for good luck. Udon Thani city is home to some very good value accommodation with some excellent options close to Central Plaza and easy to reach from the train and bus stations. You’ll find plenty of dining options in the modern air-conditioned mall of Central Plaza, but if you prefer your food to be served in open-sided restaurants check out UD Town close to the train station. Also a short walk from the station you’ll find a night market and street stalls as well as two entertainment zones aimed mainly at non-Thais; Day and Night and the wonderfully named Nutty Park. For nightlife with a local twist, Thais get their groove on at Tawaeng Daeng behind Central Plaza. The area around the Fountain Roundabout is a popular one with locals in the evening with a number of food stalls and vendors. Udon Thani is well-known for the Red Lotus Sea (Talay Bua Daeng) a lake which is filled with tens of thousands of pink water lilies during the cool season from November to February. The lotus flowers begin to bloom at the end of the rainy season in October and are usually at their most visually stunning from December to January. The annual Red Lotus Sea Festival is held in January. Udon Thani bus station and railway station are both within easy walking distance of Central Plaza and the nighttime entertainment area of Soi Samphanthamit (often referred to locally as ‘Soi Farang’). Udon Thani airport is a 10-15 minute drive away from the centre of town. There are frequent flights to and from Bangkok and also a direct service operated by Nok Air between Chiang Mai and Udon Thani. Services to Udon Thani depart from Bangkok Hualamphong with an average journey time of around 9 hours. Udon Tani train station is located a short walk away from Central Plaza and a cluster of hotels. From Udon bus station there are regular buses and mini-buses running to Nong Khai (for Vientiane) as well as other destinations in Isaan including Khon Kaen, Korat and Chaiyaphum. There are also services to and from Bangkok and a number of other destinations in Thailand including Chiang Rai and Chiang Mai. If you are intending to take the Thai-Lao international bus from Udon Thani to Vientiane, please note that you need to be in possession of a Lao visa in advance. You will be asked to show this and your passport when buying the bus ticket. Otherwise you can take the ordinary bus to Nong Khai and transfer from there to the Friendship Bridge and the crossing into Laos. From Udon Thani airport there is a shared taxi service to the Friendship Bridge in Nong Khai for 200 Baht. An efficient bus and songthaew system operates during the day in Udon, but unless you spend much time here or can speak Thai, it can be difficult to work out the best routes. An easy alternative is to take one of the distinctive motorised samlors (tuk-tuks). Prices will vary depending on distance and your negotiating skills, but expect to pay from 30-100 Baht per trip within the city. For a trip to the airport, most drivers will quote 120-150 Baht, but you might be able to get it for 100 Baht. Arriving at the airport, there is a shared taxi/mini-van service with a set price of 80 Baht per person into town (price checked September 2015).